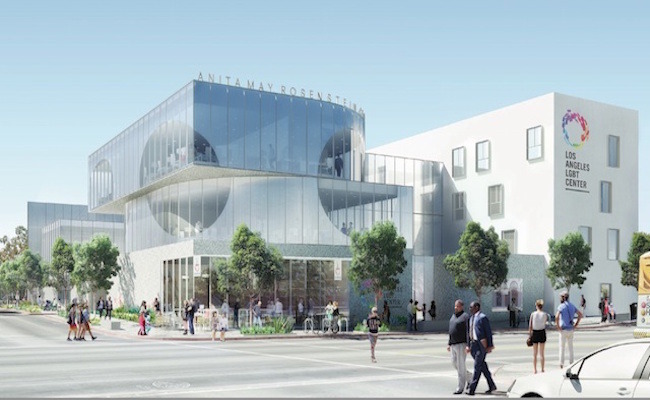 The Los Angeles LGBT Center is preparing to kick off construction on the new Anita May Rosenstein Campus in Hollywood. Though the project won’t be complete until 2019, there’s already a lot of buzz about it because the plan is to house about 200 LGBT seniors and young adults, aged 18-24, together in the same space. Why comingle seniors and young adults? For starters, they’re two of the most at-risk groups within the LGBT community, particularly when it comes to housing. Young gay and trans people are disproportionately homeless, jobless and impoverished. Due to discrimination and a lack of family support, these barely adults can have trouble finding their footing in the world after coming out. Meanwhile, LGBT senior citizens have trouble finding affordable accommodations of their own. Not all elder centers have open-minded staff members eager to take in queer seniors. Even when they are admitted, fellow retirement home residents can be nasty in these settings, too. Having grown up in an era where acceptance and tolerance for LGBT people was far from the norm, these other people and their prejudices can make it difficult for gay and non-gender conforming seniors to retire in peace. In the Los Angeles living facility, seniors and young people alike will have the freedom to live true to their identity without fear of repercussions. It’s a safe haven that both generations desperately need, so why not create a shared space? The hope is that the intergenerational relationships that form in this setting will be beneficial for all parties. Since LGBT youth – particularly those teens in need of housing – are often estranged from their families, fostering bonds with older people who won’t withhold affection because of their sexuality is important to their development. By the same token, LGBT seniors are four times less likely to have children than the average older American. Here, the seniors won’t need to have biological grandkids to spend fulfilling time with people of a younger generation. We’ve seen similar set-ups in other parts of the world to connect young and old people together in a shared living space. In the Netherlands, for example, college students can avoid dormitory expenses by instead living in a senior living facility and volunteering time with the elderly residents. Both the students and elders report enjoying the perks of this cohabitation. Still, the Los Angeles community will be even more deliberate given its LGBT focus. LGBT activists often discuss the generational divide amongst its own members. The history of the fight for gay rights is not well-known amongst millennials, so sharing these stories now is important before the current senior generation disappears. Moreover, while LGBT causes have certainly made significant progress in the past several decades, there’s no doubt that gay seniors and young adults alike have more shared experiences than they might initially consider. If nothing else, living side by side will facilitate new shared experiences.